NOTE: The table top shown has been discontinued and replaced with the Tri-Slat Top. 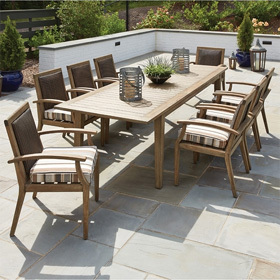 Designed for deep comfort during meals and meticulously handcrafted to provide maximum longevity, this dining set features four cushioned arm chairs and one aluminum dining table. The chairs are notable for their generously sized cushions and sturdy, traditionally styled aluminum frames highlighted by elegant crossbar patterns. Chair 26"W x 31.5"D x 37.5"H 37 lbs. Dining Table 36"W x 36"L x 29"H 64 lbs.